I still can't believe that we pulled it off. I am currently at the peak of my busy season as a tax accountant. 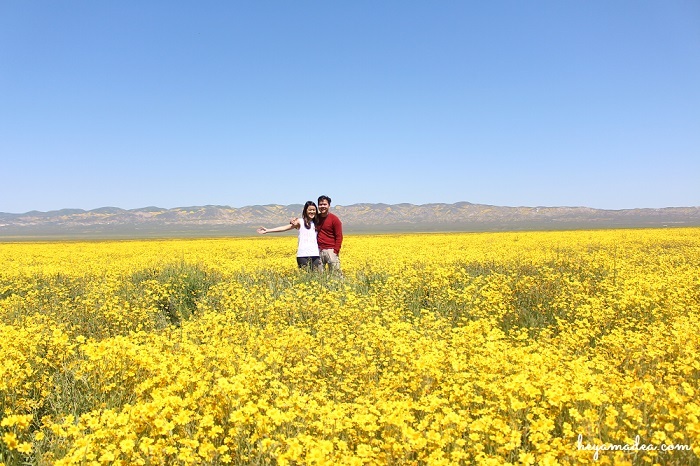 When our friends shared their trips to see the Super Bloom at Carizzo Plains, my husband instantly asked me to go. Looking at the pictures, I didn't even think twice to say, "Let's go!" It was an impromptu getaway, a very short one I might add. I leave it to Ocep to share you the deets of the trip since he was the one who planned everything, but let me just tell you that 4-hour drive was totally worth it. We literally just had less than 24 hours to enjoy the flowers and everything before we had to go back but it was worth it. Continue on reading and watch our trip here! Hello everyone, this is Ocep, Amadea's (awesome) husband. Since it's only a two days one night trip, the planning was really simple! I booked a room in Taft, CA. I just picked a hotel that has good reviews and value, we spent $85 for a single night at Holland Inn and Suites. It's a good place to stay, it offers free parking and free wifi. The owner was nice, too. He actually gave us a copy of Carrizo Plain map when we checked out the next morning. Carrizo Plain has two entrances, north and south. From Taft, you can opt for either on as they are roughly the same distance from the town. We went for south entrance since we had to drive north anyway to go home. It took us about half hour to get to the south entrance. I didn't really think it through and just drove north on Soda Lake Road towards visitor center and stopped here and there (see map here). The flowers surely didn't disappoint! About 10 minute-drive from the entrance, we were welcomed by a hill full of yellow monolopia flowers. People parked their cars at the side of the road and so we did. The hills were literally blanketed by these yellow flowers, they looked ridiculous! We spent almost a good hour there before moving on. We drove another half hour until we noticed a huge patch of purple flowers in the distance on the right side of the road. So we continued driving until we bumped into a side road leading towards the patch. We turned right and drove for another 10 minutes or so until we arrived at a parking spot. We parked our car there and walked further inland following people. It was around 1.5 mile walk but it was worth it. We arrived at a field full of purple lupine flowers! I was really excited since it was the first time for me to see a single place covered by whole lot of purple flowers! We spent maybe 1.5 hours there to take pictures and enjoy the moment. Go early in the morning! Since it's spring, the sun already rises by 6 or 7 am. That way, there will be less crowds and the picture will be much nicer since the sun is not too harsh early on. So I would suggest for you to arrive in the plain by 8AM at the latest. From there, we walked back to the parking spot and got back to the main road. We drove until we got to an area where on your left and right side it was miles and miles of yellow monolopia flowers. The flowers were so dense that you kind had to make your way if you want to walk deeper into it. Lucky for us, there were already tracks left behind by previous visitors. We took pictures, enjoyed our time and actually had our lunch with a view! We continued north and saw the visitor center. But since it was already around 2PM, we decided to continue driving, make right on Simmler Road and go east. There were also a lot of flowers along Simmler road, especially near Soda Lake on both sides of the road. We decided to stop there and walk towards the lake. It was also pretty since you would walk on the dry lake bed. The lake bed was white in color and it feels spongy when you step on it. Paired with yellow and white flowers, the scenery was fantastic and looked a bit out of this world. It was a perfect ending for our trip. After about an hour or so, we went back to the main road exited Carrizo and headed back to reality.